THE YOUNG GODS / SECOND NATURE PICTURE DISC on Preorder Now! – Chain D.L.K. THE YOUNG GODS / SECOND NATURE PICTURE DISC on Preorder Now! Like many other unique creators, the young gods have never let trends or fashion interfere with their music… Thats why, since 1985, the trio from switzerland cultivates its own sound, its own rhythm and its own world, that has naturally grown and evolved through the years to become one of the most unpredictable and powerful outlets in the worldwide sonic turmoil. From their early mixes of new wave, stooges-like powertrip and electronic ambient (furiously captured on their 87 first lp), the young gods have covered a large scale of yesterday’s and today’s music that incorporates organic sounds from outer space (on “l’eau rouge”), elements of classical music (on “play kurt weill”) or heavy metal satire (on the amazing “tv sky” in 92)… That has never overloaded their major songwriting talent. A talent that reminds us today of such soulful and poetic artists as the Doors, Jeff buckley, Pink floyd, Nine Inch nails or Kraftwerk. After a live album (“live sky tour”) came in 95 the overwhelming and worldwide success of “only heaven” (released on interscope us and produced once again by roli mosimann), a record that proved that the band was not just another industrial outfit but one of the most important musical channels of the last decade. With six albums to date, the young gods have created a magical universe of sound, landscapes and emotions attracting a huge and eclectic following, still surprised by the many different aspects of their music. In 98, after being involved with various projects (al comet and “heaven deconstruction”) al and franz parted company from long time drummer üse. But the young gods soon recruited another long time friend, bernard trontin, to join them in their journey and they started a new european tour to melt themselves into a new form of blood rush, mind and sweat live experience. Back in their hometown in 99, the pioneers of sampling started to build their own studio and locked themselves in to work on new songs, a long and awaited process of creation that as usual will be as unique as the fusion of three free electrons. Today, with the electronic overdose, the out of focus rock world and the multicultural melting pot, the young gods return with one of their most unanticipated and strong albums to date, “second nature” (produced by the band itself), an unclassifiable flow of digital and organic emotion showing the band at their highest energy level, pure and simple. Through such strong tracks as “lucidogen” (the first single), “attends”, the mindblowing “supersonic” or “the sound in your eyes” and astral journeys as “in the otherland”, and “toi du monde”, the young gods have proven their relevance and their will to push the wall of sounds, forward. Tomorrow will be another rebirth for the gods. Remastered – High Quality Sound. The Young Gods (TYG) are a Swiss post-industrial band from Fribourg. The band’s lineup has generally consisted of a trio composed by a vocalist, a keyboardist / sampler operator and a drummer. Their instrumentation often includes sampled electric guitars, drums, keyboards, and other samples. The lyrics are depicted in English, French and German. Roli Mosimann of Swans has worked with the group as a producer. In 2007 they did a Take-Away Show acoustic video session. Notable hits are: “Did You Miss Me?”, “Envoyé!”, “Longue Route”, “Skinflowers”, and “Kissing the Sun”. 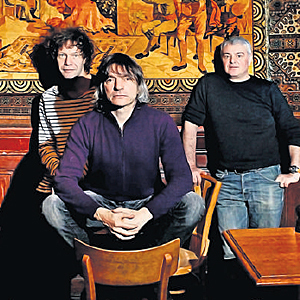 In December 2012, The Young Gods give a small series of concerts to celebrate the 25th anniversary of their first album (1987). The group will play songs from their first two albums (“The Young Gods” and “L’eau rouge”). The line-up will be Franz Treichler (vocals), Bernard Trontin (drums) and Cesare Pizzi (samplers).